Today’s offering is yet another recipe from my handy-dandy Fleischmann’s Yeast cookbook (their yeast is way too expensive, but their cookbook is great!). I’ve modified it a bit to fit my preferences, but the bones of the recipe are from Fleischmann’s. Because 6 ounces of cheese is required for two medium-sized loaves, this is perhaps not the most frugal bread ever, but it is really tasty. Since the cheese is not standing on its own, I do not find it necessary to use really high dollar cheese (not that I really ever buy high dollar cheese), so this bread doesn’t have to be exorbitantly expensive. The $1.50 block of cheddar from Aldi works just fine. And though the recipe calls for sharp cheddar, I’ve also had good success with mild cheddar cheese, and even Colby cheese. You could even combine the random bits of shreddable cheese hanging around your fridge and use them up in this loaf. As with most of my recipes, this one starts with flour, sugar, yeast, and salt. Add warm water and milk, and beat for several minutes. Add enough of the remaining flour to make a soft but manageable dough. Turn out onto a floured surface, and knead in cheese, 1/2 cup or so at a time. By the time you get the cheese thoroughly incorporated, the dough should be sufficiently kneaded. 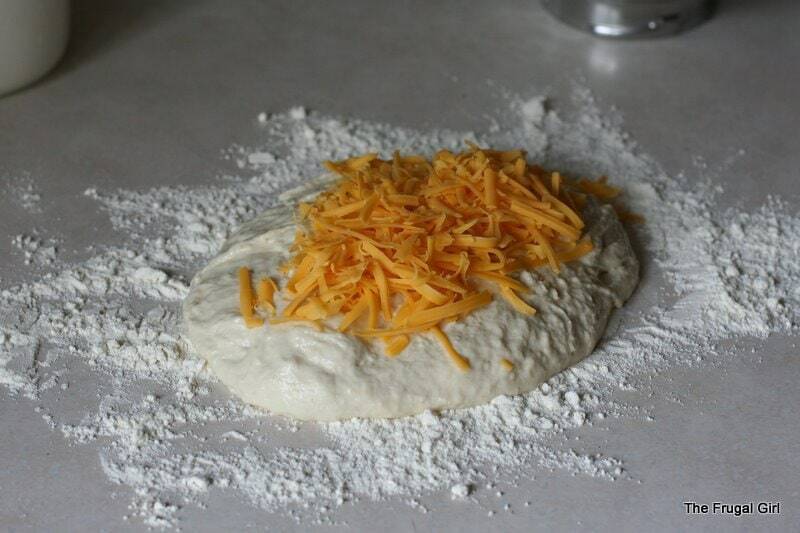 This dough feels really, really strange when you knead it, thanks to the cheese, and it looks kind of funny too. Cover the dough and let it rise for about an hour, or until it’s doubled in size. After the dough has risen, punch it down, divide it into six pieces, and roll each piece into a 12-14 inch rope. Braid three strands and place on a greased baking sheet. Repeat with remaining three strands. Cover and let rise until doubled, about 30-45 minutes. If desired, sprinkle with additional cheese. Bake at 350 for 20-25 minutes, or until lightly browned. 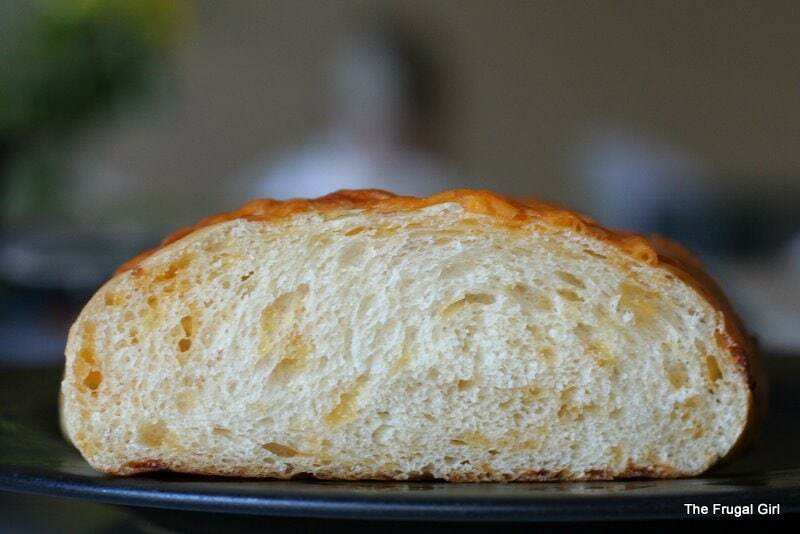 And here’s a peek inside the bread…you can see all the little flecks of cheese. It’s tasty as is, but the cheese flavor is especially good if you toast your slices before eating them. And toasted, buttered slices make a lovely accompaniment to a pot of homemade soup. 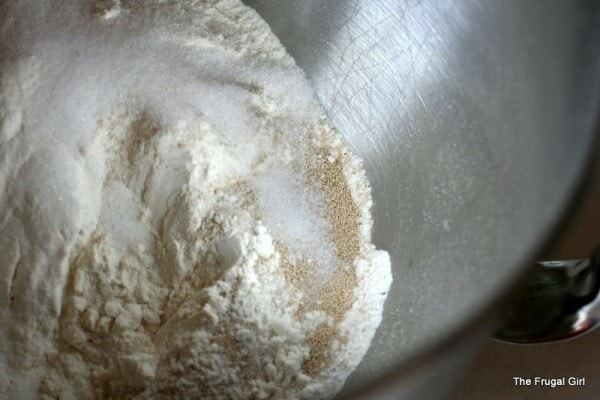 In mixer bowl, combine 1.5 cups flour with the sugar, yeast, and salt. Heat water and milk to 120 degrees F, and add to dry ingredients. Beat for 3 minutes, and add enough of the remaining flour to make a soft dough. Turn out onto a floured surface and knead in cheese, 1/2 cup at a time. Place kneaded dough into a bowl, cover with a wet tea towel, and let rise in a warm place for 1 hour, or until doubled. 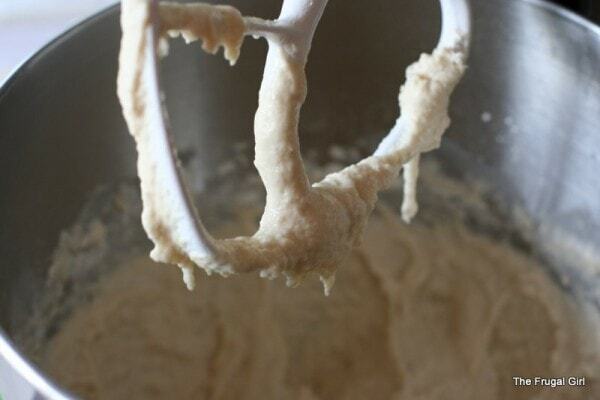 Punch dough down and divide into 6 pieces. Roll each piece into a 12-14 inch rope. 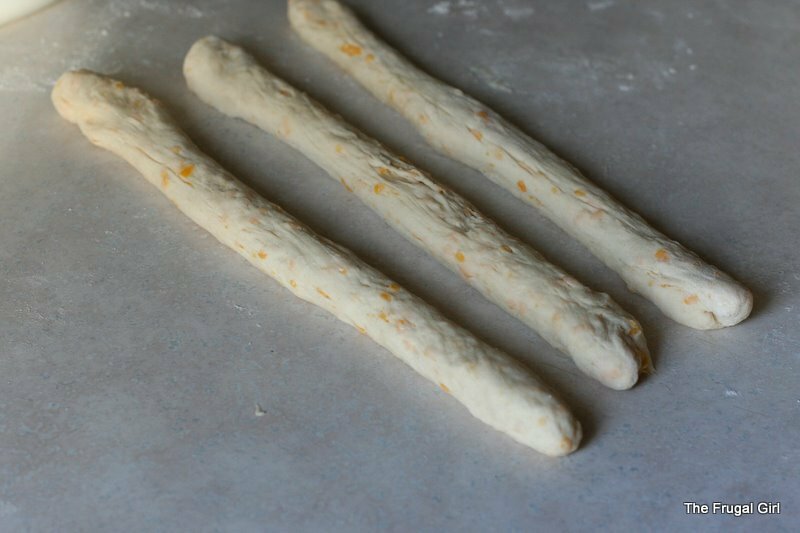 Braid three ropes together and place on a greased baking sheet. Repeat with remaining three ropes. 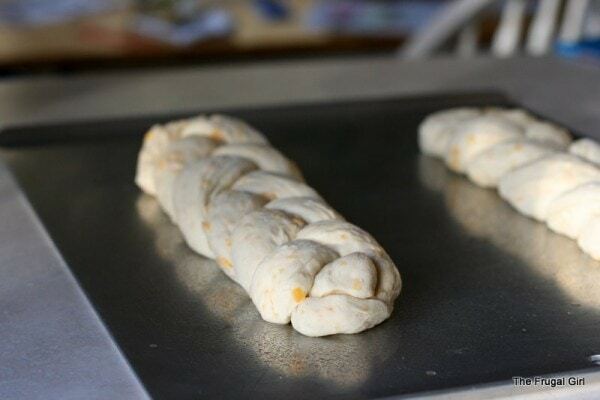 Cover braids and let rise until doubled, 30-45 minutes. Bake in a preheated 350 degree oven for 20-25 minutes or until lightly browned. Let cool on a wire rack. How timely, my boys like to take cheese buns for lunch and I was thinking how great – and much cheaper – it would be if I could make them myself. I have been reading your blog for a bit and absolutely love all your posts and especially the pictures. You are inspiring me! I made your homemade hamburger buns yesterday but mine didn’t look at all like your photos the bottoms burned and the tops were still white. This however did not stop us from eating them, we sliced off the bottoms and they were delicious. I made crusty rolls once before and had the same result. I can bake french bread and just about any square/cake/loaf so I DO know how to bake, honest! Any ideas why? Thank you again for an inspiring post. I will definitely be trying these – as buns once I figure out how to bake them without burning the bottoms. Hmmm…are you using a baking sheet with a dark non-stick finish? If you are, that can cause the bottoms of your rolls/bread to burn before the top is done baking. I use baking sheets that are not shiny and are plain aluminum (Vollrath is the company that makes them), because I always had trouble when I used dark pans. I’m so glad my blog is helping you! I was so craving soup and bread today. This will be perfect! I’m imagining this with the superb parmesano reggiano someone gave me recently. But only if I have a properly appreciative audience! Have you ever read/used bread books by Bernard Clayton? He has two main ones, a tome on everything and a specialized book of “small breads” inclulding rolls, pitas and scones. I think the dough looks pretty. Yes, I had his huge book of breads, but I think I got rid of it at some point. I don’t remember exactly why, really. lol I think the size of it was overwhelming to me, and it had no pictures either (you wouldn’t be surprised to know that I prefer at least a few pictures in my cookbooks!). Yumm….I think I’m drooling a bit! This looks awesome. I might need to make cheese bread to go with the roast chicken tonight. My husband has been baking us bread every week… I’m not really sure what inspired him, but I am NOT complaining and I’m certainly enjoying his new habit for as long as it lasts! I’ve been telling him to try some of your recipes. Maybe this will be the one. Yum! This looks delicious and you make it look easy…I don’t know if my bread braiding would look as good as yours though!! Orange cheddar cheese. Ick! I know that it’s just the extract from a South American plant but we here in New England eat our cheese white. Of course, we’re as close to English cheddar as you can get. I see orange and think Velveeta and bleh. Still, the bread looks nice. I’ll definitely try it sometime. May I call you a cheese snob? I’ve been eating orange Colby and cheddar cheese my whole life, so orange does not equal yucky to me. lol I am totally NOT a fan of processed cheese, though…American cheese slices gross me out. Well it dates back to the days when we were English Colonists (or at least my ancestors were) and they wanted Americans to color their cheese so that they could tell which was to be taxed as an import and what was home grown. They used to use carrot juice on American Cheddar IIRC. My dad had relatives in the cheese making industry so I guess I can be a cheese snob, at least when it comes to cheddar. I will always pay more for the good stuff. American made (Vermont) Cheddar is one thing I don’t go frugal on. By the way, a good frugal thing about cheese is that if it develops a little mold you can just cut it off and keep going. I am drooling at my desk…that looks amazing! Looks yummy! Why do you knead it by hand rather than use your kitchen aid? Does it really make that much of a difference? Oh, another reason I prefer to knead by hand is that when I’m making a large batch of dough, it can’t all be kneaded in the mixer…there’s just not space. This looks really good. I am going to have to make it soon! What kind of yeast do you use again? I have been using the big pack from Sam’s. It works okay. That’s exactly what I use (well, mine’s from Costco, but it’s basically the same thing). Yeast is so, so cheap at warehouse stores…LOVE that! Love this blog! You’re an inspiration. Going to bake this weekend. Thanks for the recipe. BTW, your photos are WAY too big. Can you back up a bit? Hurts the eyes. Sorry, Morrison, I don’t agree. I love love love Kristen’s photos, and I have never thought they were too big. To me, they fit perfectly in the space. 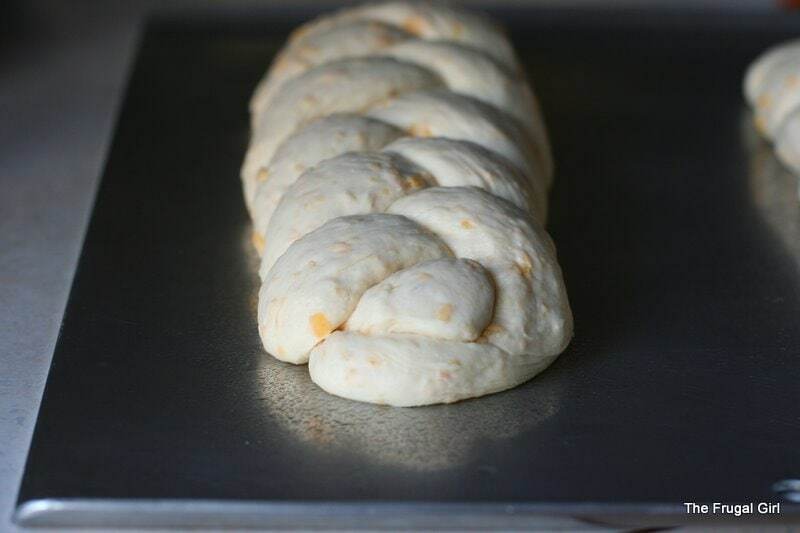 Braided cheese bread is rising, and ready to be served with dinner. As an added bonus, I was wondering how to use up some miscellaneous cheese from my fridge. The bread has about 2 oz mozzarella and 4 oz cheddar. That’s it. I can’t read your blog on Wednesday nights anymore. It makes me too hungry! Several times a week, some good friends and I split dinner and do it potluck style, each bringing one small dish and sharing so we get more variety (and, of course, the good company ) and a good chunk of what I’ve been bringing for the last month or so have been your bread recipes, to rave reviews. I finally gave up the address to your blog to them, so my secret’s probably out now. Ah well. But all that to say: thanks for doing this! It’s much appreciated. Hi Kristen. Plan to make this tonight…..is it okay to use skim milk in the recipe? Yep, skim is totally fine! I usually use 2%, since that’s what we have around most of the time, but skim will work too. I made this bread yesterday and we all loved it! Thank you so much for sharing the recipe and great photos! Several weeks ago I stumbled upon your sight and have been “lurking”� ever since. I was instantly hooked on your site when the first thing to pop up when I clicked on your link was the photo of the cinnamon coffee crumble cake! Yes, by some complete coincidence I found you on a WednesdayJ I cook home cooked meals every night for my family, garden and can or freeze our harvest, coupon like crazy to save money and really evaluate a new purchase before I make it, LOVE photography and am a scrap booking maniac…..but the one thing I was too afraid to try was home baked (things that need yeast and have to rise) goodies for my family. My husband grew up with a mom and grandma that always made homemade breads etc and my one attempt 10 years ago was a complete failure. Over the last few weeks as I have read through your post, old and new, I was confident I could at least attempt your Braided Cheese bread with my stuffed Manicotti meal I made last night. What happened…..it was a HUGE success! My family loved it, my husband raved and an entire loaf disappeared with our meal last night (my kids are only 6 and 23 months) so that goes to show you who ate the majority of the loaf. My husband said it was perfect but I know it wasn’t. I will give myself a 90% what was wrong…it didn’t rise enough and my dough was a little heavy, so I went back to your site to research my issue and because of your wonderful post and Q&A sessions I know I used too much flour. We won’t tell my family this I will just know for next time. So the moral of my long comment is THANK YOU THANK YOU THANK YOU! 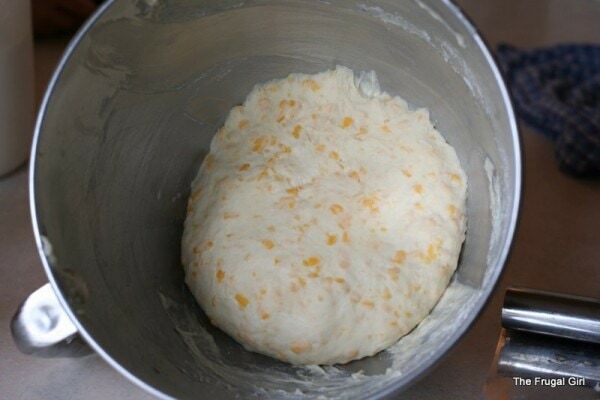 Your great photos, and I really do mean great, your incredible step-by-step directions, your problem question and answer posts and just your entire post on baking breads have turned this scared yeast and rising recipe lady into a homemade bread maker! I would LOVE to start composting for my garden, but I’m not sure there would be much composting going on in �30 degree weather in ND. If you need yeast, King Arthur has free shipping( ends today) on their yeast which is SAF instant( its great). 5.95 total cost. What a wonderful site. I just found it today. Saw it on KNOE TV news this morning. Thank you so much for creating this site and sharing with everyone. I was wondering… You make all your bread from scratch, right? Do you make just the average loaf of “sandwich” bread? If so, have you done any cost comparisons for all the ingredients? Because a loaf of bread at Aldi is like, $0.79. Cant see how the fraction of a bag of flour and other ingredients works out to be saving all that much money. It’s worth it on the ‘gourmet’ breads and other things. 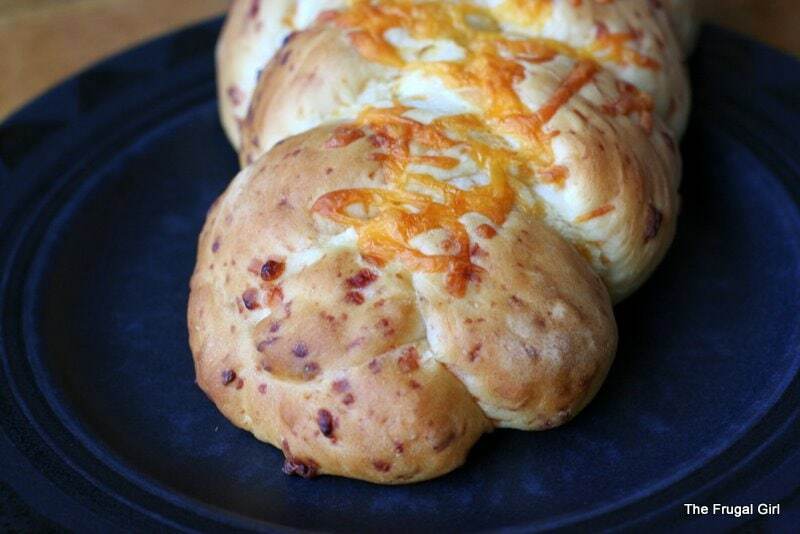 I love baking (though I hate cooking), and I will definitely be trying out the cheese bread. Does it make a difference to use the ‘quick rise’ yeast? Always Awesome photos and recipes!!! I made this earlier in the week and we loved it. My husband said this was the best bread I ever made. We will be making it again and I will be linking this recipe to the recipe page on my blog. Thanks for another great recipe! Bread was awesome! At what point in the process can we freeze the dough. I have heard to freeze before the first rise and I have heard to freeze after the first rise. They say to increase the yeast when freezing. Please advise what is the best process to freeze your bread. I generally freeze after baking. If you want to freeze before baking with this dough, I’d probably let it rest for 20 minutes after kneading, then freeze it. Let it thaw totally when you want to use it, then braid it and let it rise as usual. Oh My Goodness! 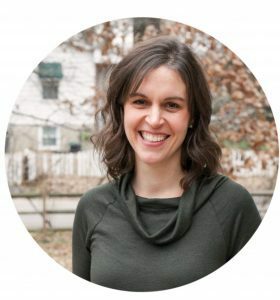 I do not normally make comments on blogs and I just recently found this wonderful blog site (and I am totally in love with it, btw). 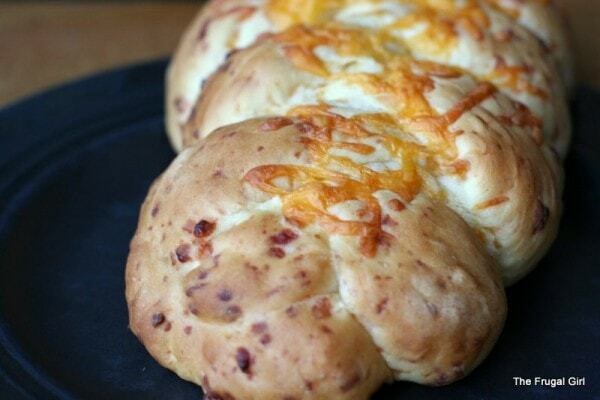 Anyway, I tried this recipe for the Braided Cheese Bread and just HAVE to sing it’s praises. This was one of the best breads we have tried and it was an absolute hit (especially now that we are transitioning into cooler fall days). This was so good and so easy to do. I already have plans to add it to the family Thanksgiving dinner this year! Thanks! Yay! I’m so glad! Thanks for taking the time to leave a comment. Love your blog and your recipes! I’m about to make the braided cheese bread, and I wanted to point out that 1 1/2 cups isn’t equal to 6 oz. It’s 12 oz. A cup is 8 oz. Hoping the 1 1/2 measurement is the accurate one because, really, can there ever be too much cheese? If not, next time I’ll go with 6 oz. The 1.5 is right! If you were measuring liquid, then 1.5 cups would indeed be 12 ounces. But shredded cheese is not nearly as solid as liquid, and I find that 6 ounces of shredded cheese does amount to 1.5 cups, assuming you’re not pushing the cheese down firmly like you would brown sugar.